Thank you for your seeing. RainbowLink Inc.("RL") is committed to your satisfaction. RL takes your privacy very seriously and strive to make the RL&apos;s site experience both enjoyable and trustworthy. RL collects information about Your Personal Information and Your Customer&apos;s Information to provide RL&apos;s Services only. You can see all of RL&apos;s service at "Catalogue of RainbowLink Inc.", the catalog & shopping page of RL at this site. ( → SEE Catalogue of RainbowLink Inc.). RL provides RL&apos;s services by RL&apos;s own data-center in JAPAN. RL&apos;s data-center consists of servers, routers, firewalls, back-up-servers, log-servers. RL has been built servers (platforms) for itself to provide RL&apos;s software as services by using Debian of Linux. RL&apos;s online-software have been developed and made by RL from scratch, this means that software RL provides do not depend on any script anybodyelse developed. RL&apos;s data-center consists of RL&apos;s LAN only. So, when you stop to use RL&apos;s account, RL can promptly and completely remove your information and your customer&apos;s information without information that you inputted in "RL-Start-Steps". And software RL provides are strong against attacks that assume RL&apos;s servers have any security hole. When you tell RL "Remove my information now!" through RL&apos;s contact form, RL can remove your information and your customer&apos;s information promptly and completely. And RL won&apos;t sell any software / application that has User&apos;s Information to anybody. RL owns a data center in order to provide Software as a Service that RL developed from scratch. (1) RL provides RL&apos;s site by 2 protocols. If you see the error page about REFERER-INFORMATIONS and HOSTNAME, you need to re-access and reload the page. (4) RL is committed to the privacy and integrity of RL&apos;s e-commerce transaction experience. RL uses 2048-bit encryption technologies when transferring and receiving customer data exchanged within RL&apos;s site. On , RL provides 2 types of SSL. 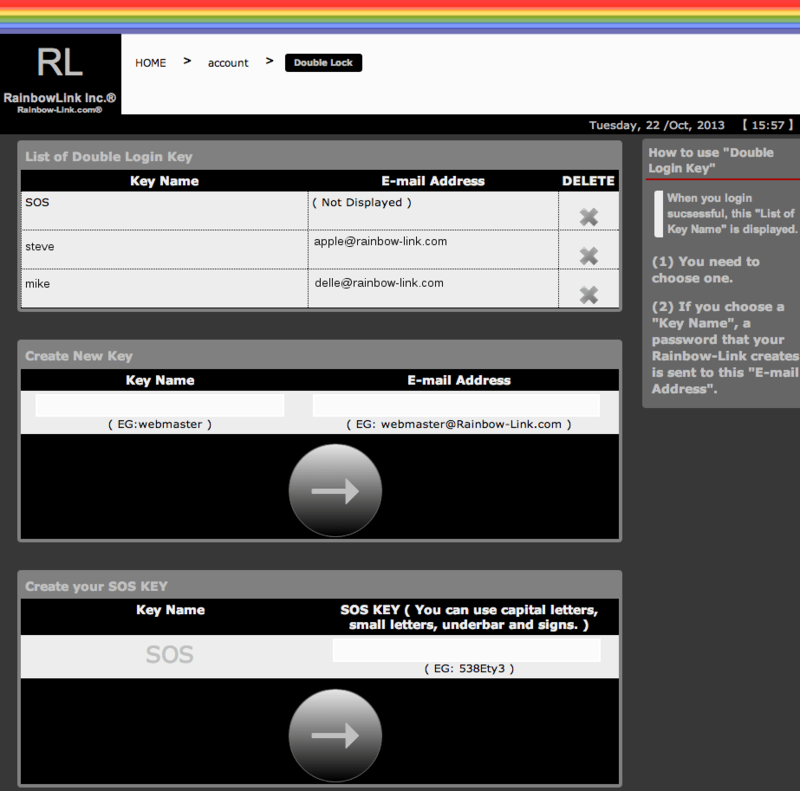 You can choose favorite one when you login the "Rainbow-Link ControlPanel®" and contact RL. You can check the cert and its chains on your browser. Click the key-mark of your browser, and the cert is displays. (5) All page of RL&apos;s site is written in HTML5. HTML5 can be browsed correctly by browsers like Safari, Opera, Chrome etc. (1) About the System of the DomainBoard. The DomainBoard is the message board system that RL created and manages. RL owns a data center in order to provide DomainBoard that RL developed from scratch. (2) About technology without the System of the DomainBoard. Chrome Web Store of Google Inc. The map function is used in the "DomainBoard"
, because the applications of (1) are provided on one of the sites of RL ( ***.Rainbow-Link.com ). Since Dec 31, 2018, RL uses cookie ( session type ) in a WordPress Plugin "All Post Contact Form" in order to prevent double submission. RL is not in the business of collecting Your Personal Information and Your Customer&apos;s Information. Personal information refers to information freely given on RL&apos;s site such as name, phone number, address, email address for purchases and unique identifier information (email address and password) if you choose to create an account with RL. Please note that some "freely-given" information is required to complete transactions on RL&apos;s site. Should you choose not to give this information, you may not be able to enjoy all functions of RL&apos;s site. RL does not collect credit card information. RL uses the PayPal & Stripe on RL&apos;s shopping cart system. And RL is not in the business of collecting Any Statistic Information. RL is not in the business of selling Any Information. RL sells only software RL made and the ad-services. RL won&apos;t sell any software / application that has User&apos;s Information to anybody. Your email address, as part of your RL Account registration, or if you correspond with RL directly. Your Personal Information and Your Customer&apos;s Information (as outlined above). Transaction order information and history. You may also access this information if you are a registered RL user and login to your Account. RL made and manages Free Board Service, the "DomainBoard of the Rainbow-Link". Because RL has to provide a safty PR place for RL&apos;s "Rainbow-Link" users. From the time of RL&apos;s founding, RL provides two types of inquiry form for entering personal information and the inquiry form which doesn&apos;t need to enter personal information. About the information sent to RL via the inquiry form for entering personal information, RL will give you response via an e-mail, and RL doesn&apos;t send/leak/divulge/use anything outside unless RL has to be deal with in order to protect RL itself. About the information sent to RL via the inquiry form for NON-entering personal information, RL will give you RL&apos;s response via RL&apos;s FAQ or RL&apos;s official Twitter account. In order to respond to the public, RL guides you before you send us an inquiry. RL collects information about Your Personal Information and Your Customer&apos;s Information to provide RL&apos;s Services only. You can see all of RL&apos;s service at "Catalogue of RainbowLink Inc." ( → SEE Catalogue of RainbowLink Inc.). 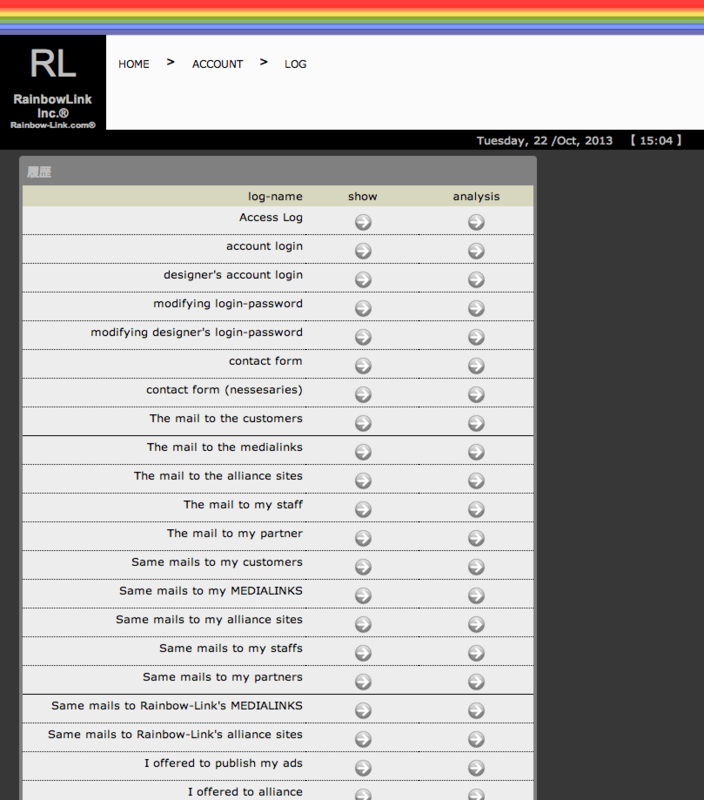 RL writes names of relation companies, individulas and groups on the page of "about us" at RL&apos;s site. RL has nothing to do with individuals or companies or groups whose name are not written in the page. RL displayed some of its free applications, from May 15, 2014 to Nov 8, 2015. When you stop to use RL&apos;s account, RL promptly removes your information and your customer&apos;s information from RL&apos;s all servers. RL provides RL&apos;s services by RL&apos;s own data-center in JAPAN. RL&apos;s data-center consists of servers, routers, firewalls, back-up-servers, log-servers. RL has been built servers (platforms) to provide RL&apos;s software as services by Debian of Linux for oneself. RL&apos;s online-software have been developed and made by RL, this means that software RL provides do not depend on any script anybodyelse developed. RL&apos;s data-center consists of RL&apos;s LAN only. So, when you stop to use RL&apos;s account, RL can promptly and completely remove your information and your customer&apos;s information without information that you inputted in "RL-Start-Steps". And software RL provides are strong against attacks that assume RL&apos;s servers have any security hole. When you tell RL "Remove my information now!" through RL&apos;s contact form, RL can remove your information and your customer&apos;s information promptly and completely. 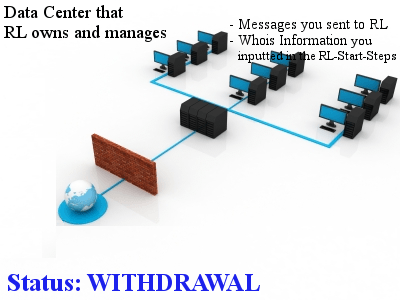 RL has appropriate security measures in place in RL&apos;s own data-center to protect against loss, misuse or alteration of information RL has collected from you at RL&apos;s site. (1) You need to create an Account at RL&apos;s site if you would like to use RL&apos;s software as services. RL&apos;s account does not have and store your credit card information because RL uses the PayPal service to provide the credit card payment service. If you would like to create your RL "Rainbow-Link" account, you need to register the same information that you have registered in Whois database. (If you would like to create your RL "without the Rainbow-Link" account, you do not need to). You can access Your Personal Information and Your Customer&apos;s Information at any time on your RL account. You may also login to see the status of your online orders and purchase history on your RL account. You can amend Your Personal Information and Your Customer&apos;s Information at any time through RL&apos;s contact-form ( if the RL account is the RL "Rainbow-Link" account, you can amend Your Personal Information and Your Customer&apos;s Information under the condition that you regisiter the same information that you have registered in Whois database ). You can create a password for your designer when you would like to chanege designs of your "RL-Online-Ctalogue", the homepage-building-and-managing-tool of "Rainbow-Link®". If, at any time, you choose to cancel your RL Account, simply push a button. If you plan to remove your RL account and Your Personal Information and Your Customer&apos;s Information, you only push a button. (2) RL does not login your account without your permission. If RL logins your account with your permission, the login-log "maintenance.Rainbow-Link.com" registeres in your "HOME > account > LOG" page. (3) Since March 3 in 2011, RL has provided you the "Double Lock" ( = "Two Factor Authentication" ) service to your RL account within the SaaS fee. You can lock your account "login password" that you create and "Double Login Key" that RL&apos;s SaaS automatically creates per your login. In the case you use this "Double Lock", if you login successfully, your "Rainbow-Link Control Panel" displays the "List of KeyName" ( And the "Search-Bar for searching a KeyName" ). You need to choose one to login your RL account. If you choose one, you can receive the "Double Login Key" in your mail box. You can register E-mail addresses as long as you want. RL reccomends that you register your mobile-E-mail-address. In the case you can not receive "Double Login Key", RL provides "SOS key" service. You can login by using "SOS key" without E-mail box. If you use "Double Lock", the "KeyName" is stored and displayed your "account login log". This "Double Lock" system is created and managed by RL. The "Double Lock Mail" is sent from RL&apos;s server. (2) RL shall not disclose your information without your consent. If Japanese Government ( or any authorities ) says RL needs to disclose your information, RL&apos;ll tell you the fact that Japanese Government ( or any authorities ) says RL needs to disclose your information. (1) RL shall not disclose your information without your consent. If Japanese Government ( or any authorities ) says RL needs to disclose your information, RL shall tell you the fact that Japanese Government ( or any authorities ) says RL needs to disclose your information. (2) RL has a lot of users all over the world. Since the 2nd business year, RL has more world-users than Japanese-users. Therefore, RL hopes to resolve any difference in claim occured between world-users and RL by talking not a law. (3) If you and RL can not resolve any difference in claim by talking, you and RL need to use laws. RL assumes this case, RL writes this paragraph. Your relationship with RL under regal documents provided by RL shall be governed by the laws of JAPAN. You and RL agree to submit to the exclusive jurisdiction of the courts located within the pref of Nagano in Japan to resolve any legal matter arising from agreements. The laws of Japan do not have any provision for punitive damages. The laws of Japan were made models of the laws of Germany and the laws of France. Your attachment file(s) can&apos;t go through our mail-servers. If you&apos;d like to send (an) attachment file(s) to us, please use our outside-server (https://www.secure-formmail.net) which we have rent. Dear Customers/Visitors who couldn&apos;t open our upload form on secure-formmail.net：　Send your referer, and click here and open the page again. RL added 3-2 "What kind of technology RL uses in downloadable software RL created". RL deleted about a FireFox addon from the column of the DomainBoard. RL added the wording 'unless RL has to be deal with in order to protect RL itself' to 4. RL does not login your account without your permission. If RL logins your account with your permission, the login-log "maintenance.Rainbow-Link.com" registeres in your "HOME > account > LOG" page. <p class="content">(2)&nbsp;RL shall not disclose your information without your consent. If Japanese Government ( or any authorities ) says RL needs to disclose your information, RL&apos;ll tell you the fact that Japanese Government ( or any authorities ) says RL needs to disclose your information. Use <a href="https://RL.Rainbow-Link.com/main/CONTACT_STEP1.htm?&id=30" rel="nofollow">this SSL-CONTACT-FORM at RL&apos;s site</a> &#8594;. (1)&nbsp;RL shall not disclose your information without your consent. If Japanese Government ( or any authorities ) says RL needs to disclose your information, RL shall tell you the fact that Japanese Government ( or any authorities ) says RL needs to disclose your information. <p class="content">(2)&nbsp;RL has a lot of users all over the world. Since the 2nd business year, RL has more world-users than Japanese-users. Therefore, RL hopes to resolve any difference in claim occured between world-users and RL by talking not a law. Nov 23, 2010: RL added "6". Jan 27, 2011: RL added "9". Nov 5, 2017: Deleted: about iTunes App Store because RL stopped selling apps for iOS. Apr 10, 2018: Added: about Stripe because RL joined Stripe.com for the "ONLINE-CATALOGUE" of the "Rainbow-Link". Click here to see the archives of this column till today.